We’re back in Ancient Greece for this one from long-serving slot designers Playtech. 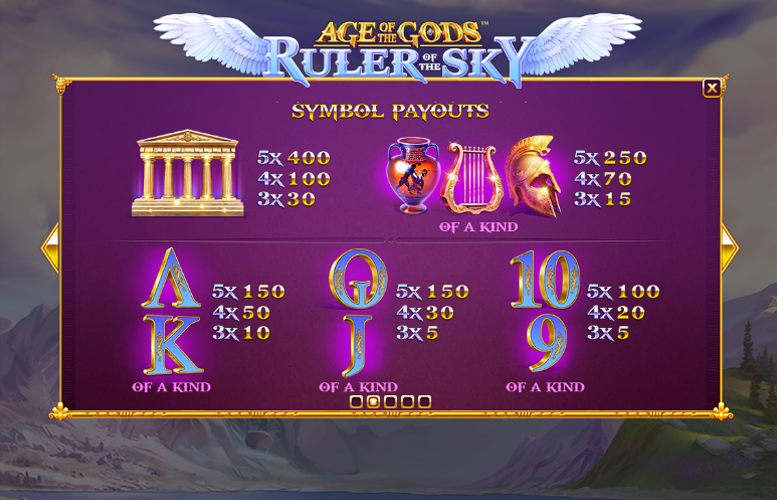 The Age of the Gods: Ruler of the Sky slot is like the other titles in the series visually. However, multiple issues make this title perhaps the worst of the Age of the Gods machines. There has been no real thought into the special features and frankly, the return-to-player rating is woeful. Its only redeeming feature is the progressive jackpot mode but why anyone would want to play for long enough to trigger it, losing almost 9% per spin, is beyond us. Can win a lifechanging sum of money. 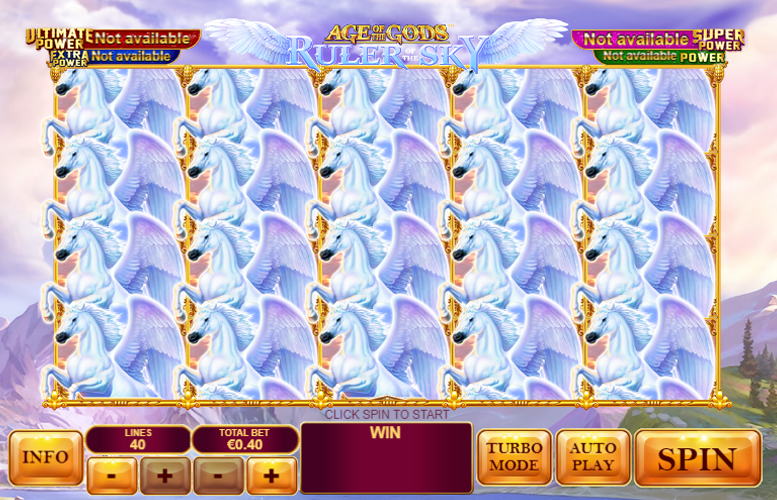 We love progressive jackpot games and the Age of the Gods shared jackpot can reach some dizzying heights. Low return-to-player rating. At just 91%, it’s hard to see why anyone would voluntarily play this title. Limited game features. The only true game feature on Age of the Gods: Ruler of the Sky is a free spin mode that features no modifiers and no multipliers – not so exciting! Parthenon = 400x the line bet. Urn, Harp, or Helmet = 250x the line bet. On top of these prize the slot is also connected to the Age of Gods jackpot pool meaning the top prize can run well into the hundreds of thousands of pounds. Landing three of the Mighty Pegasus Game Logo symbols simultaneously on reels two, three, and four will trigger five Mighty Pegasus Free Games. 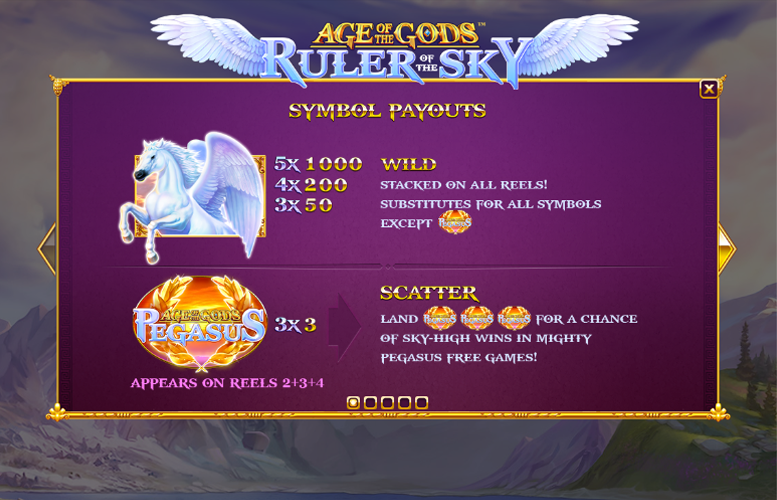 During these free spins, there will be additional Pegasus symbols added to the reels. What’s more, players will be awarded with an extra five free games for landing another three Game Logo symbols on the reels. These additional bonus stages can be retriggered indefinitely. Most of the Age of the Gods series are linked to the same four mystery progressive jackpot rounds. The potentially lifechanging jackpots are known as: Power, Extra Power, Super Power, and Ultimate Power. 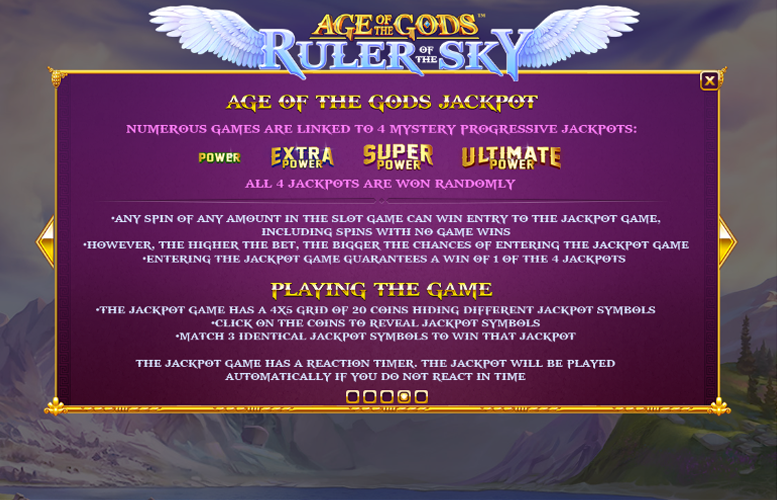 The Age of the Gods Jackpot is triggered randomly and can activate on any single spin – even those that don’t award game wins. However, the higher the bet, the greater the chances of entering the jackpot mode. All players who activate the jackpot mode will be awarded with one of the four jackpots on offer. When the side game starts, players are presented with a total of 20 golden coins. Behind each one is a logo representing one of the four jackpots listed above. Clicking on each coin will reveal the symbols. Once the player matches three of the same symbols, they will be awarded the relevant prize. Ace, King, Queen, or Jack = 150x the line bet. Ten or Nine = 100x the line bet. 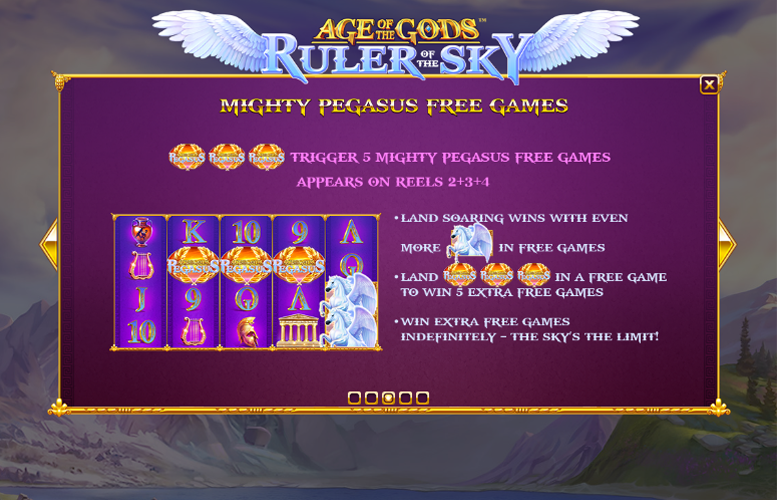 Players are given a reasonable amount of control over how they spread their bets on the Age of the Gods: Ruler of the Sky slot machine. Firstly, they can adjust the number of win lines bet upon per spin. These range from just one, up to the maximum of 40. They can also choose how many coins they wish to bet on each line too. Here, the options start at 1p and reach £10. 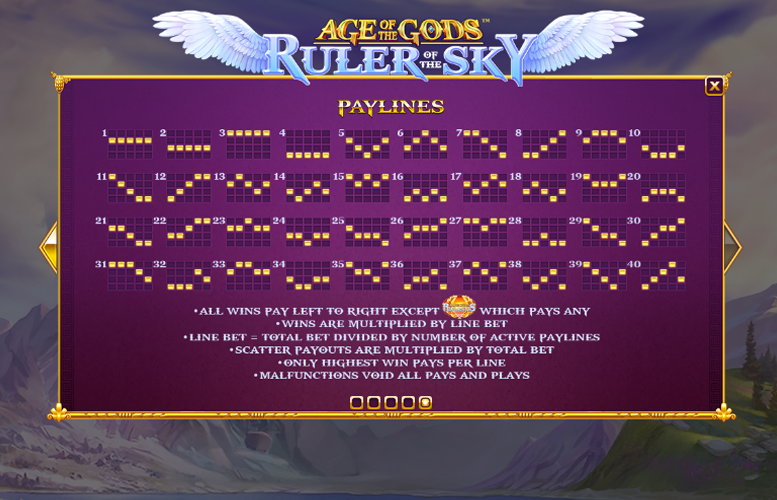 This means with everything set to its minimum, the lowest possible bet per spin on Age of the Gods: Ruler of the Sky is just 1p. Meanwhile, with everything maxed out, the largest possible wager per turn is a reasonably impressive £400. Whilst this isn’t the highest betting limit we’ve ever seen, it will certainly satisfy all but the very richest players. The Age of the Gods: Ruler of the Sky slot fails to live up to its peers in the series. Unfortunately, the title suffers numerous flaws that make it hard to like, let alone love. Firstly, there is a distinct lack of innovation in the feature department. Players can win a free spins mode and that’s about it in terms of regular side games. Couple this with the frankly terrible return-to-player rating offered and it’s easy to see why we’re not fans of the game. Perhaps the only good thing about the title is the inclusion of the Age of the Gods progressive jackpot feature. However, this is nowhere near enough to win us over. This game has a rating of 2 / 5 with 327 total reviews by the users.